2nd paragraph But in addition to the "Starman" dummy sitting in the driver's seat, the vehicle likely also carries a payload of uncounted and unseen hitchhikers that could spell trouble for the Martian environment: terrestrial microbes. Bacteria from Earth might be heading for Mars, riding alongside "Starman" on Elon Musk's Tesla in space. Elon Musk's cherry-red, spacefaring Tesla Roadster launched spectacularly on Feb. 6, carried by the Falcon Heavy rocket and on a course carrying the car toward Mars. 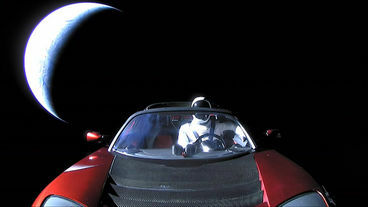 But in addition to the "Starman" dummy sitting in the driver's seat, the vehicle likely also carries a payload of uncounted and unseen hitchhikers that could spell trouble for the Martian environment: terrestrial microbes. "If there is an indigenous Mars biota, it's at risk of being contaminated by terrestrial life," Jay Melosh, a Purdue University professor of Earth, atmospheric and planetary sciences, said in the statement. Even if technicians had radiated the outside of the car to kill microbes, the engine could still be contaminated, as car engines aren't assembled in a sterile environment, Melosh added. But wouldn't the harsh conditions in space — extreme temperatures, unfiltered solar radiation and low pressure — simply kill off any Earth bacteria on the Roadster? Not necessarily, said Alina Alexeenko, a professor of aeronautics and astronautics at Purdue. Techniques used in the lab for freeze-drying live bacteria utilize conditions similar to those that microbes would encounter in space, which means that any Earth microbes riding on the Tesla might experience only suspension of their normal functions until they reach a more hospitable environment, according to the statement. Transporting terrestrial microbes to another planet could be setting the stage for a microbial battleground, in which Earth bacteria take on native bacteria and overwhelm them, the scientists warned. "The load of bacteria on the Tesla could be considered a biothreat, or a backup copy of life on Earth," Alexeenko said. However, the current course of the Roadster does not set it up for a collision with the Red Planet. As of today (March 5), the Roadster has reached a distance of nearly 5 million miles (8 million kilometers) from Earth, according to the live-tracking website Where Is Roadster?, which is not affiliated with Elon Musk, Tesla or SpaceX. The car is an estimated 122 million miles (196 million km) from Mars, moving away from our planet at a speed of 7,264 mph (11,690 km/h), the website reported. The Roadster's orbit follows an elliptical path around the sun, and the car is expected to intersect with Mars's orbit for the first time in July, from a distance of about 70 million miles (110 million km), Space.com reported. Musk's car will reach its closest position to Mars in October 2020, passing by at a distance of about 4.4 million miles (7 million km). That's still not close enough for Mars's gravitational pull to snag the car — making it unlikely that the Roadster will establish orbit or land on Mars — but unforeseen factors over time could still affect the car's speed and trajectory, Space.com reported. Then again, it's also probable that radiation will shred Musk's Roadster within a year anyway, so there's probably very little to worry about.